Either Those Curtains explores an artistic response to interior space as the true central point of individual freedom, both in the physical sense of a body in a space, and cognitive inner space. This exhibition explores how the arrangement of personal interior space can reflect our attitudes to the shared social construction of civility in the exterior world. The interior of a home surpasses the concept of it being merely a dwelling space, as we arrange and augment interior space in a way that echoes our values. While public social events take place under the influence of the spatial architectonics ascribed by a third party, the home is a curated realm where smaller and more direct social gatherings are inherently dominated by the individual. While the mid-twentieth century brought with it a burgeoning sense of modernist optimism, which coincided with an aspirational conceit, today sees a more fragmented schema in regards to the value of interior. From the urban luxury high-rise, to gated communities, to ‘poor doors’, properties are now bought and sold based on 3D computer renderings years before being built. What does this say of our current notion of the home? Is the last bastion or fortress of individual civility also an illusion, does emphasis on the virtual also cause our perception of our own space to become virtual? 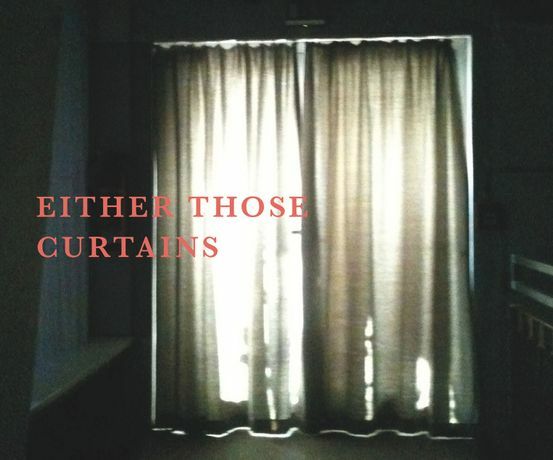 Either Those Curtains explores an artistic response to interior space as the true central point of individual freedom, both in the physical sense of a body in a space, and cognitive inner space. To illustrate how we can use these spaces to comply with systemic conformity or create auxiliary logics and perceptual alternatives.